Ms. Pie and I were heading south for our annual summer weekend in Atlanta. That means shopping for her and record stores and pizza for me. 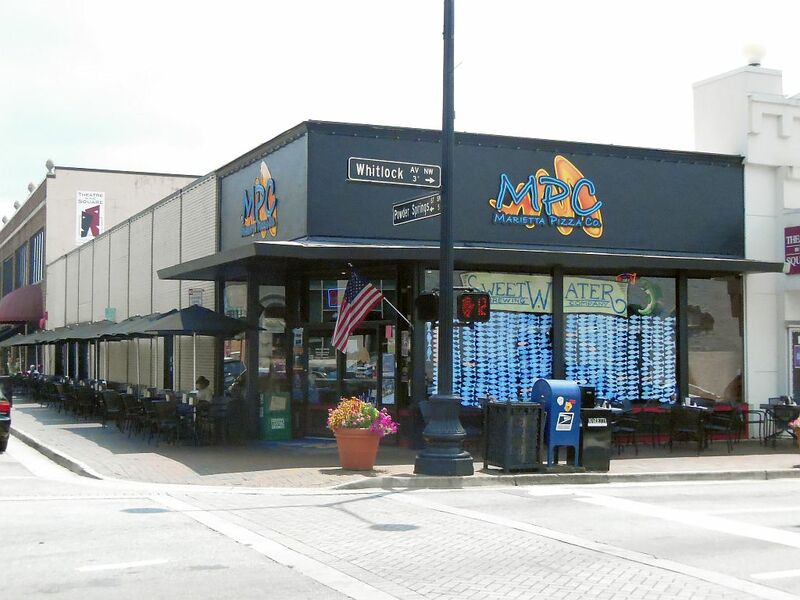 Our first planned stop was lunch, and we chose to visit a sushi place located in Marietta’s cool downtown square. After finishing, I playfully pulled out my iPhone Pizza Compass app to find that I was only 500 feet away from the Marietta Pizza Company. I therefore gave Ms. Pie a pass to shop, so I could grab a totally unexpected slice for a post-lunch snack. MPC holds some prime real estate on one of the corners of the square in addition to another location on the west side of the town. 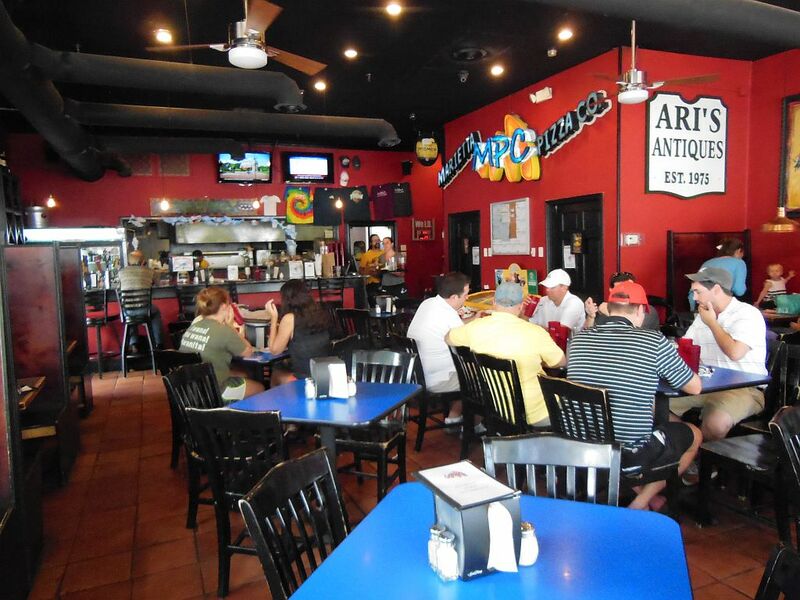 I entered the vibrant atmosphere and grabbed a seat at the far counter facing the open kitchen. Making good use of their corner location, there was additional seating outside overlooking the town square. Supporting local artists, they sport a wild logo and hang several interesting abstract works on their walls. The menu was fairly typical along with some interesting appetizers, salads, and wings. Much to my delight they had slices available for $2. I had some trepidation since the joint looked more hipster than it did Italian. The menu, however, was lined up correctly with plain cheese at the top and specialty pies at the bottom below the toppings. Beer was available since MPC houses what they call the Sweet Water Brewing Company. 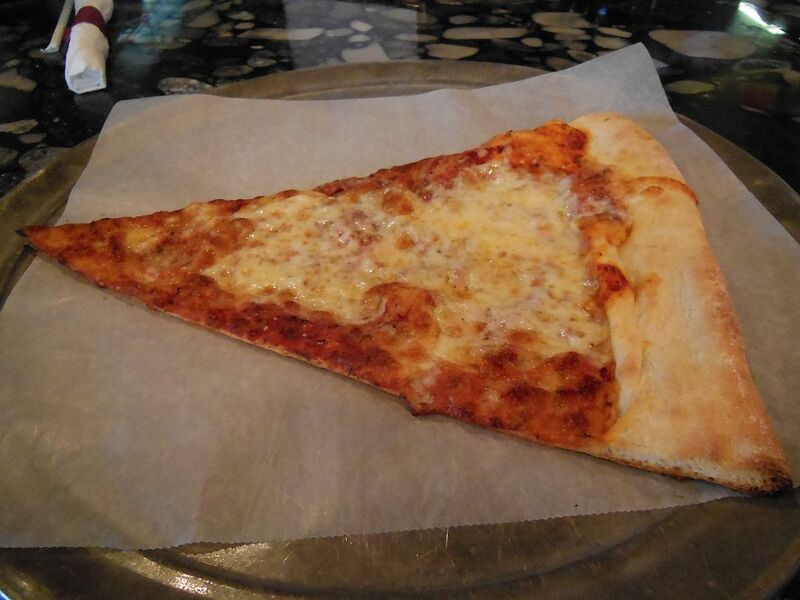 Short on time, I quickly ordered a single plain cheese slice with a water chaser. The menu said “baked to order,” and although my slice was pre-prepped, it took some time to cook. Served up fresh and hot on its own silver platter, it was a little larger than usual both in terms of width and length and had a big crust handle on the end. The MPC slice was extra-thin—so thin, in fact, that it flopped when held out despite the fact that its crust was quite crisp. The construction of the sauce and cheese was somewhat untraditional with the cheese lumped heavier in the middle rather then spread throughout. The crust, although nicely blackened, crisp, and chewy, seemed to be made from a different type of flour. Like the joint itself, the slice was hipper than it was classic. All in all, my slice was a delightfully tasty treat. The Snob gives MPC high marks for its pie execution. However, the non-classic touch with the ingredients put their pie just outside of the Snob’s perfection zone. Nonetheless, I’d sure stop in again to grab a quick one if I ever got the chance.